9 Meanwhile a large crowd of Jews found out that Jesus was there and came, not only because of him but also to see Lazarus, whom he had raised from the dead. 10 So the chief priests made plans to kill Lazarus as well, 11 for on account of him many of the Jews were going over to Jesus and putting their faith in him. In these opening verses of chapter 12, we see once again the many different ways in which people responded towards Jesus. There are many characters in this story. We have Jesus’ friends, which included Lazarus and his sisters. We see a contrast between the two sisters in the actions they take. We gain more insight into one of Jesus’ disciples, namely Judas Iscariot. And finally, we read a little bit about the Jewish people and their religious leaders. All of these characters respond differently to Jesus. Starting from the end of the story, we read that many people were coming out to see Jesus, the miracle worker, the One who had raised Lazarus from the dead. Some may have come simply out of curiosity, as word-of-mouth spread about how Jesus had resurrected a man from the grave. Even so, this sense of wonder and curiosity led many of them to believe in Jesus, when they saw with their own eyes what Jesus had done. This is in such contrast to the religious leaders. They too had heard the stories about Jesus’ miraculous powers, but this did not lead them to seek for truth or bring them to a faith in Jesus. No, they were reacting more out of jealousy, seeing that the people were rejecting their authority and going over to Jesus. They saw Jesus as a threat to their religious structure and order which gave them such purpose and such power. They were thinking of themselves, not of what God was doing through Jesus. Meanwhile, back at this house where the party to honor Jesus was happening, most of the people were quite content to sit and listen to Jesus. And this is a good place to be, close to the One who had come from God and had demonstrated that God was working through Him. But notice the differences between the two sisters. This day was a great day, a day to honor Jesus, and what do we see Mary and Martha doing? Martha was busy preparing and serving all the guests who had come. Now someone might say, “Well, someone had to do this.” But we have reason to believe that this party is not taking place in their home, for it talks about Lazarus being one of those “reclining (relaxing) at the tables”. Most likely, they were guests also in someone else’s home. We read elsewhere (in Luke 10:38-42) almost the same thing, that Martha was “distracted” by all the preparations, while Mary sat at the feet of Jesus and soaked in all that Jesus said. Both sisters loved Jesus as a very dear friend, but one was working to please Jesus, while the other was pleasing Jesus by her pure heart and devotion towards Him. Not much needs to be said about the last person, Judas. His statement of offense at Mary’s actions might have the appearance of putting others first, namely the poor people of that area. But all he really cared about was himself, and taking advantage of the position he had as the treasurer of the group. As John states through hindsight, Judas was just a thief. And this begs the question for all of us. What are we doing when we come to Jesus today? What is the intent of our hearts? Are we hard-hearted like the religious leaders who are more concerned about religions rituals and regulations, than meeting the One from God face-to-face? Are we involved in a church just because of the position of power and authority we can obtain, and seek to get all we can for ourselves? Are we “busy” as Christians, but not taking time to develop our relationship with Christ? Are we at least coming to the table to listen to what Jesus is teaching us? That is good, but it must not stop just there. Can we be like Mary and find that which is most precious to us and offer it up to Jesus? There are many ways in which we can honor Jesus in our lives. The best ways will always involve doing things for God and others that come at some cost to ourselves. This will show God exactly where our heart is towards Him and His Son, Jesus. In the technological world that we live in today, it is considered quite normal to become highly specialized in our vocational field. This can be said about us who are Bible translators, or should I say Linguists. We often come to the field with Master’s degrees in linguistics or Biblical studies, or both. As you will see below in the update sent by a colleague of ours from Pioneer Bible Translators, knowing and working with biblical and foreign languages is a major part of our work. In our last newsletter, my wife told you what a typical day/week looks like for her and this month it is my turn. Like her, every day looks a little different and every week looks much different than the previous. I will first tell you what my office time looks like, then what a week looks like when I travel, and finally what I fill my other time with. When I am in the office, I am doing a variety of things, but two main things. The first is looking over the biblical passages that I will check with the translators so that when I go to visit them I am prepared with notes of things to talk about. The second is continuing to learn Swahili. I do this by reviewing vocabulary and doing a word for word translation of the Swahili Bible to understand both more vocabulary and grammar. There have been multiple trips where I have gone to a nearby town to help one of the translation projects I am responsible for helping. When I am there, the main thing we do is go over Scriptures they have translated and compare them by looking at the Greek Scriptures and notes I have made before hand. The goal of our time together is to get the meaning of the Scriptures accurately translated into their language. Also when I have been in this town, I have had the privilege of being able to distribute Scripture portions and so far that has been my favorite part of making the trips to this town. As far as what fills my other time, the list seems quite endless at times. I love doing anything which helps with getting the Scriptures into peoples’ hands and hopefully their hearts. Right now this means passing out Scriptures, talking to as many people as I can about what we are doing—whether it be pastors or people I meet every day. In addition to this we are planning many other things such as: showing Jesus Films, starting Bible reading groups, putting recorded Scriptures on the radio and so much more. For any of you who know me well, you know that I like doing things with my hands. This means I constantly have projects I am doing around the house, and at one time my list was three pages long. Whether it is repairing doors, fixing cabinets, plumbing and electricity problems, hanging curtains for my wife, digging holes for trash, the list is quite unique and I can always find something to do around the house. Also I have had fun doing things with my hands for others that has included: building shelves, making an oven out of dirt, sand, straw and water (this was a lot of fun), scraping and painting ceilings, prepping walls for paint, and a variety of other things. Recently I have become more involved with building a church in a nearby village (thanks in large part to the generosity of a VBS group back home). So as you can tell it is very hard for me to describe what a typical day/week looks like for me. Hopefully this gives you a little bit of an idea of what consumes my time. I love being here and I feel so honored to be serving in so many different ways. Thanks for being a part of our ministry here. Without you, none of this would be possible. I can totally identify with my friend on how many other kinds of things a translator can get himself involved with. Even though our specialized training is to do Bible exegesis and translation, there are always so many other things that need our attention, whether we live in a large city or in a remote village. In fact, the old concept that a missionary needs to be a “Jack-of-all-trades” is still true today. When we lived in our village, I learned a whole lot about plumbing, electrical work, carpentry, small engine mechanics and so much more. That’s just life on the field. That is why we are constantly asking people who have these trade skills to consider coming over to the mission field to help out in these areas. Just think how much more attention we can give to our translation projects if we don’t have to stop and fix our car or repair our houses. So for anyone who is reading this article, if God gave you the knowledge and skill to do these other support work activities, we would sure like to hear from you. Perhaps God is calling you to the mission field. You never know. But God will bless you and reward you with great experiences, and what you do can help us concentrate on getting God’s Word out to the nations. In our study today of the Gospel of John, we see that “the Jews sent priests and Levites from Jerusalem to ask him, ‘Who are you?’” This may appear to be an innocent request from some of the religious leaders of John’s day, but that could not be further from the truth. These leaders are mystified by John’s ministry, and his success as mentioned in Matthew 3:5 – 6, immediately leads them into a conflict with each other. You would think that the question “Who are you?” was rather straight forward and simple. What’s interesting is John’s response, “I am not the Christ.” Obviously there is more going on here than our text is able to tell us. Clearly these priests were expecting John to be some great person since they went on to ask him whether he had the spirit of one of the greatest prophets of the Old Testament, or even the special “Prophet” that Moses hinted about in Deuteronomy 18:18. In order to understand what is happening, we must look at some of the key words in this text, and then build a picture that makes sense of all of the parts. Then we will understand what’s going on. So allow me to give you some important Old and New Testament background, and then let me ask each of us an important question, especially to those of us who are in Christian leadership positions. 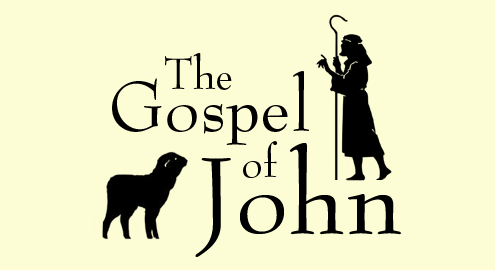 In John’s Gospel, even more than in the books of Matthew, Mark and Luke, the term “the Jews” which occasionally does refer to all members of the Jewish nation, is much more narrowly used by John. Throughout John’s book, “the Jews” are for the most part the religious leaders (comprised of Pharisees, Sadducees, and the scribes who were experts in the Law of Moses, the priests, the Levites and the elders of the nation). And we constantly see “the Jews” debating and arguing with Jesus and ultimately demanding that Jesus be crucified. What first starts as arrogance and skeptical resistance, turns in time to become defiant challenge and then open hostility. So you can pretty much know then from the start that these are the bad guys, the antagonists to all the men of God, and by extension are found to be the enemies of God. But they should have known better. They were the inheritors of the Word of God, and the protectors of the Temple and the religious rituals that were to lead the people into the true worship of God. And we too see time and time again, that it is the church leadership which has become cemented in its ways of religious traditions that have actually managed to keep people away from finding God for themselves. And so they challenged John, what he was doing, where he was from, and from whom he got the authority to lead this spiritual revival. (It certainly did not come from the Jewish leaders.) But they figured if John was not sponsored within their religious structures, then perhaps he must be one of the three great people who were prophesied in the Old Testament who would come back to help the nation of Israel. But even before they speak, John denies that he is not the Promised Messiah, the Christ (or Anointed One) whom God would one day send to rescue the nation Israel and becomes its King. Unfortunately, the leaders and the people had it wrong and thought God would send a human political Saviour who would rescue the nation from the oppression of the Roman occupying forces in Palestine. But John also said he is not “The Prophet” who would be just like the greatest Old Testament leader, Moses, who rescued Israel out of Egypt. In Deuteronomy 18:18, Moses prophesied that a Great Prophet like him would one day come to help Israel. But that was not to be John. And in Malachi 4:5, the second last verse of the Old Testament, a prophecy was made that Elijah would return before the coming of the Lord. I can say that these Jewish leaders had some good questions in one sense. They knew that John was special. They just did not know how or why. The truth of the matter is that John came as a simple servant of the Lord, and even in the midst of great success, he exercised even greater humility. And why was that? Because it is never meant to be about us, no matter how important we think we are at times. No it is all about Jesus, the Man who would come after John. So let me ask each of us who are Christians? Are we more like The Jews, or are we more like John. Think about it. And now for the final chapter. This has been quite a journey. We started together way back in January of this year, and now 12 months later I am ready to tell you how the story ends. But wait, it’s not really the end, because I am believing that there are many more exciting years ahead of fruitful service for the Lord. This topic of “Who Am I?” has been a series of snapshots of what has happened in my life from birth until the present moment. There certainly have been lots of interesting events and winding trails in my life as I look back over the past 51 years. There have been some truly awesome moments of breath-taking adventure, and there have been a number of mind-numbing “sloughs of despair”. One thing for sure, you cannot say that our lives have ever been dull. In many ways, it is quite appropriate I think that I am writing this last Saturday personal journey story on the night of Christmas Eve. Over 2,000 years ago, while the world in stillness lay, the angels in heaven were holding their collective breathes as they waited in glorious anticipation of the Christ Child to be born. From that moment on, the world would never be the same as the Messiah came from Heaven to live among us, teach us about God, and provide a way for men to be reconciled once again back to God. Now please don’t read this wrong. I am in no way trying to compare my life to the Life of Jesus who is my Lord. Heaven forbid that I should ever dare to think so highly of myself. No, I am just a fallible man as much as any other, and I count it as a sacred privilege to be called by God to serve Him in the mission work He has given me to do. Rather, it is the idea of there being an air of expectation that I want to use as a catalyst for this final article in this personal series. As I look over my years of ministry for God, I almost feel like it could be compared to a grand symphony arrangement. In a great music score, you have a flowing thematic harmony of many instruments that lead you along the main story line of the arrangement. That is what my desire to be a missionary can be compared to, which has been a central part of my very being since I was a young teenager. Then as the music continues, you find select instruments rise above the main melody. There is excitement created by the violins, the darting whimsical nature of the wind instruments, the foreboding danger triggered by the beating of the drums. All of these sounds carry you further into the story, raising you to new heights, and casting you down into deep dark corners of your mind. That is what my many years can be compared to: one moment, a thrilling adventure, and the next moment, a heart-wrenching event that crushes the soul. But wait. The philharmonic evening has not been finished yet. There is a pause, a moment of silence, the tinkle of the little silver triangle. Then a murmuring beat from a drum, the cautious entrance of the violins, the pipes and the horns and the flutes are poised to join in to the chorus. We can sense the excitement building as we realize that there are still some upbeat moments and great crescendos to come. What a great feeling that is. Of course I know that God loves me and is always with me. Then add to that the fact that God is still choosing to use me and work through me to impact peoples lives around the world. He continues to give me strength for each day so that I can still be involved in Bible translation projects in Southeast Asia and Papua New Guinea. This past four months, I have lived and worked in Dallas and helped to teach new missionary recruits. Two years ago, I thought my life of ministry was over and I was all used up. And if that is not enough, God has opened up this blog outreach which my wife, Jill, aptly calls my “Armchair Ministry”. Considering that I spend most of my day, every day, propped up in a recliner chair to relieve the pressure and pain in my legs, it is truly amazing how writing down my stories and insights into Scripture has become a blessing to thousands of people in countries around the world. This is the second article that I want to talk about this concept of encountering detours in life. And let’s face it, the question is not whether we will encounter detours, but what to do when we encounter detours. In the last article, I mentioned that we will all have good moments, and that we must treasure those moments and count them as blessings. And now I would like to suggest that we even consider the detours of our lives to be blessings and to treasure them also. One of the first things that Atteberry does in this part of the chapter is to make a distinction between “to teach” and “to train”. I thought that this was quite good because there is an important difference between the two concepts. You can hear about something, watch something, and even study something, and that might “teach” you something important. But until you have gone through an experience, you have not really been “trained” to be able to handle that experience. I think it’s fair to say that when it comes to ministry work, and especially Bible translation work, I can be very passionate about it. Almost to the point that you could say I become so absorbed or obsessed with it that I can lose perspective with regards to other people or other important things in life. But I would never say that those 20 years between the time that I first thought about being a Bible translator until when I finally got onto the field were wasted years. This came home to me in a powerful way in 2007. 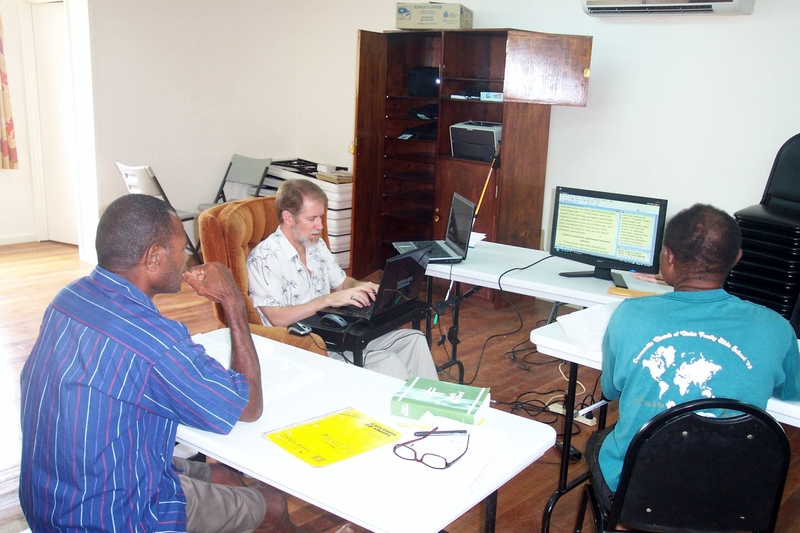 I was in PNG and attending a course to train translators to become Bible translation consultants. We were trained to listen well, ask good questions, be patient, be sensitive to cultural issues, know how to exegete Scriptures well, offer suggestions but not be forceful about it, and much more. By the third week of this course we had had opportunities to sit in and watch experienced consultants work with other missionaries and the national speakers to check their translations. We were also given opportunity to lead sessions ourselves. When the teacher of this course asked me one day how it was going for me, my reply was, “Everything in my life up to this point now make sense to me.” And I still believe that is true: my theological training plus my years of pastoral ministry plus my village experience as a translator had honed me to be able to be a good translation consultant. 2. Detours Can Test You. But just when I thought that everything was now in place for me to be traveling the world as a Bible translation consultant and trainer, that was when my muscle disease hit me and its symptoms flared up. In February of 2008, I had just returned from PNG after doing six weeks of intense consultant sessions and some training sessions. I literally went from running through airports to barely being able to walk across my own living room floor. As my health deteriorated that year, I slowly released one responsibility after another of the many international tasks that Pioneer Bible Translators had asked me to be involved in. 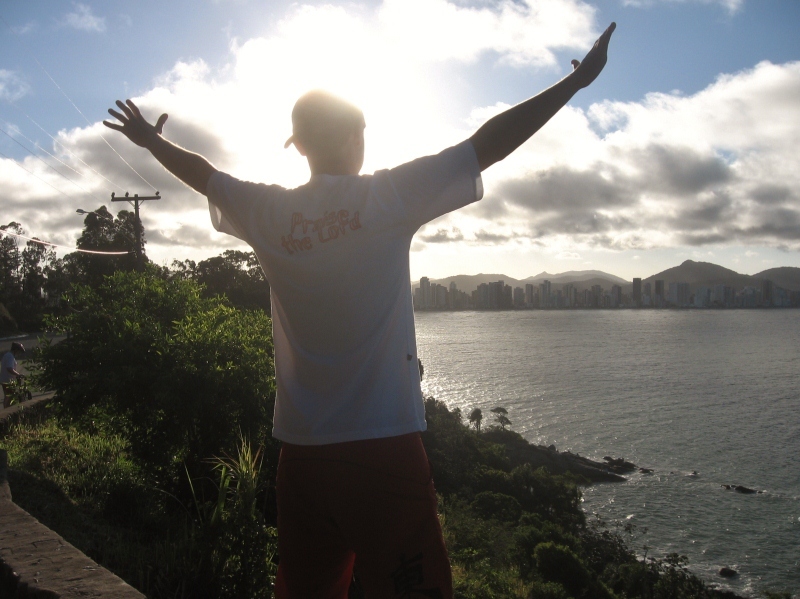 By the spring of 2009, I was hardly doing anything at all, except feeling sorry for myself. And I felt like my ministry work and even my life was coming to an end. Praise the Lord, God showed me that there were still many things that I could do and that if I leaned on him and trusted him for my daily strength, He would empower me to continue to do this translation consultant work. What I’ve come to realize is that while there may be many things that I would like to do, I am to focus in on this one thing that I can do and which God still wants me to do. Make up your mind that you’re willing to learn whatever the experience is ready to teach you. And remember that your character is being put to the test. People are watching and will be influenced for better or worse by what you say and do.